Your payment will be split into 2 entries on your credit card statement each [month or year]. This is not a mistake. The first charge is for the base subscription [$monthly or annual rate]. The second is based on the number of client seats with your plan [X seats for $X]. Your total combined payment amount is shown above. Optimizing your LinkedIn profile is beneficial to your overall online presence as a job seeker and career professional. Making sure that the following sections are filled out and well defined will ensure that your LinkedIn profile is highly visible and searchable, giving you a leg up in your job search. Raise your level of optimization above the recommended 80% by filling in the gaps for each of the following sections of your profile. This section of your LinkedIn profile is incredibly important to both the validity of your online applications and your profile’s searchability for LinkedIn and Google. Make sure the following sections in your LinkedIn profile are complete, accurate, and optimized for the jobs you’re interested. These sections of your LinkedIn profile provide the most impact to your searchability within LinkedIn search. Be sure to include the most impactful representation of yourself. Recruiters and hiring managers need to be sure that the profile they’ve found on LinkedIn corresponds to the resume they have in hand. Be sure your first and last name are present and identical to the documents you’ve submitted in your application. It helps humanize your job application when recruiters and hiring managers can put a face to the name. Having a professional, clear LinkedIn profile picture is highly beneficial to your job search. Get noticed! It’s helpful for recruiters and hiring managers to see that you’re in the vicinity of the job they’re looking to fill. If you’re not in the area, be sure to list the places to which you’d be willing to relocate in your Profile Summary below and Career Interests preferences in LinkedIn Jobs . The more details recruiters and hiring managers can see at first glance, the better your chances of being contacted through LinkedIn. It’s important in a standard LinkedIn search to have your job industry present on your profile. Selecting an industry allows a broader search to find you, and gives a more narrow search a better idea of what it is you’re looking for. The more details you can give in your LinkedIn, the more likely the correct type of recruiter or hiring manager will find you. The headline is your basic introduction. At a glance it should be clear that your headline is up to date, informative, and representative of you as a candidate. Having your job title in your headline is important to the LinkedIn search feature. When you include it in your headline, you’re more likely to be found within a search looking to fill that type of position. Be sure to include this within your LinkedIn profile’s headline. Your headline should be as descriptive as possible. If you’re an engineer who works solely in mobile technology, for example, your headline should represent that. Having the little details gives a better full-picture view of you as a candidate at first look. It also aids in your relevancy in a candidate search that includes those keywords. Good LinkedIn headlines are 6-12 words and take advantage of the 120 character limit. Your profile summary should be your elevator pitch. Using specific keywords and providing examples of your best work will give a detailed and positive first impression when you show up in candidate searches. Your profile summary should include the keywords that are most relevant to your experience, including your top hard skills. LinkedIn’s algorithms are sensitive enough to pick up on keywords within this section, so it is important to put your best, most optimized foot forward. Good LinkedIn profile summaries are 250-300 words and take advantage of the generous 2000 character limit. Make sure your work history is accurate and that it matches your resume. We recommend having at least 3 experiences listed so that you have the best chance of adding your awesome accomplishments, measurable results, and keywords. Jobscan detects the average number and types of of skills across industries. In general, the number of skills listed on your LinkedIn profile should be on par with the industry average. We use machine learning to predict some common and key skills we think you already have but is not listed on your LinkedIn profile. Recruiters view short-term employment as a potential red flag. If applicable, make sure any short-term or temp gigs are labeled as “Contract,” “Intern,” “Part-time,” or "Consulting." If not, consider removing short-term jobs from your work experience. Measurable results can set a candidate apart from the rest, especially in a broad LinkedIn search. When you have concrete, quantifiable examples of your success the proof of your value is undeniable. These measurable results are also a fast way to get recruiters and hiring managers attention in a fast-paced candidate search. It’s important to add dates to your work experience so that your LinkedIn gives the most accurate, full-picture possible. It’s also important to match the dates on your resume, so that the two are identical. Having dates in your LinkedIn profile helps a recruiter or hiring manager get an exact candidate view, and you’re more likely to be taken at face-value when all of the necessary information is easy to process as a whole. No need to hide gaps or short term stints, either leave it off your LinkedIn and resume or be as up front as possible. Your job title within this role is important to include from a recruiter or hiring manager’s perspective. It’s vital to show where you’ve been so that a quick look at your profile will show your career progression. It’s important to have these job titles present in your profile so that you’re more likely to show up in a LinkedIn search that contains this job title. We recommend having at least 3 responsibilities or tasks, or roughly one paragraph for each job you list in your LinkedIn profile. Having your most important responsibilities and measurable results listed in your job experience show that you accomplished something during your time in that role. Providing bullets of your learnings and successes will give a recruiter or hiring manager the opportunity to understand your previous experience. Be sure to keep your LinkedIn profile and resume similar in these fields, though slight variation is expected as you tailor your resume (providing all information is factual). These sections of your LinkedIn profile are a great place to add the hard skills and keywords needed to remain relevant within a LinkedIn search, and are vital to a fully optimized profile. We recommend you include the company name as part of your profile - if your company is a startup or you are self-employed, we recommend you add your company on LinkedIn. Giving the full picture on your LinkedIn is just as important as providing the accurate information within your resume, and it’s vital that these two pieces of the application match. Plus, some recruiters or hiring managers will search by previous companies so having the correct company name can potentially benefit you in a LinkedIn search. If you’re unsure about whether to exclude a company from your resume, exclude the entire section and be sure to leave it off your resume as well - just be up front when you’re asked for the full picture in an interview. The response, “The company’s values are no longer representative of mine, so I chose to leave the experience off of my professional background,” is a great response when you no longer want to be associated with a particular job experience or company. These key skills are selected by the frequency and commonality in which they appear in job descriptions. Add the missing skills to your profile. Education dates provide a clear and transparent representation of your educational background. Don’t leave dates of education off of your resume unless you have a good strategic reason to do so. For example, if you earned your degree 15 years ago and began working in your current career track the same year, you will actually raise questions about your age by not including your degree dates. If you leave the dates off this section, the recruiter or hiring manager may assume you are hiding your age to be cunning. If you’re choosing to leave dates out of your education section it should be because you have shortened your resume to the most recent 10, 15, or 20 years, and your most recent degree was earned earlier than a year or two before that cut off point. Listing the exact degree you’ve earned is important, not only to give recruiters, hiring managers, and your connections a glimpse into the years of hard work you put in earning that degree but to make sure you’re showing up in LinkedIn searches that recruiters and hiring managers perform including the degree keywords. Including your degree level is important in the verification of your education, it also gives a recruiter or hiring manager a better picture of your professional history. Verifying your educational history with the accurate institution name and credentials is an important part of a pseudo background check that LinkedIn searches provide to recruiters and hiring managers. Including your institution, organization, or university name is important to the verification of your education and gives a recruiter or hiring manager a better picture of your professional history. Plus, having those affiliations listed on your LinkedIn give you the opportunity to network and connect with alumni and classmates who may be able to provide you references or further your candidacy within an application process. Many recruiters include a degree requirement within their LinkedIn searches, so providing these details is key. Education also provides connection opportunities based on university affiliation plus the opportunity to list trade or educational courses you took to advance your skills. If a job description explicitly calls for a degree preference, such as Bachelor's of Arts or MBA, it's highly likely that recruiters scouring LinkedIn for candidates will also add this to their search queries. Be sure to add any degrees you've completed and that the degree is explicitly stated. Here are some “extras” to add to your LinkedIn that will benefit your profile. Custom URLs are a great way to ensure your LinkedIn profile is easily accessible and looks good when you list it on your resume. This feature LinkedIn provides also help your first and last name to show up higher within a LinkedIn or Google search. Increasing your number of connections verifies your previous experience by allowing more people to view, endorse and refer your LinkedIn profile. It also gives recruiters and hiring managers an idea of your level of professionalism and proactive levels online. Plus, you likely increase your search rank in LinkedIn by more direct connections to professionals. Show off a little! Honors and awards are icing on your candidate cake, giving recruiters and hiring managers a better idea of where you have excelled. 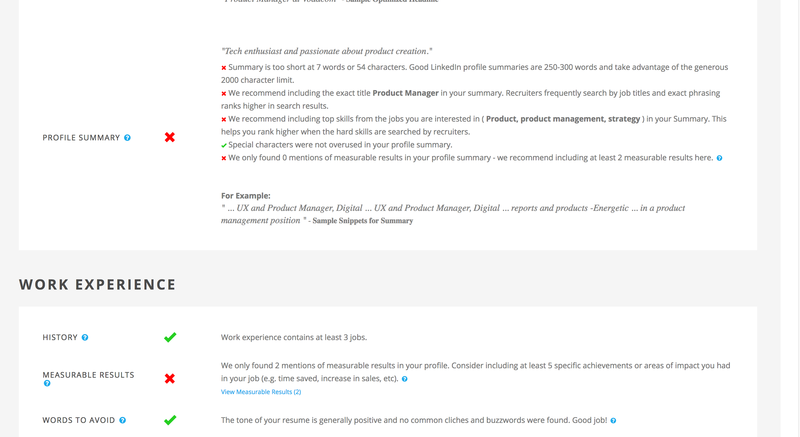 Plus, it’s another section for you to include top hard skills and keywords when you describe these accolades. Be sure you can provide a bit of context to the Honors and Awards if the acronyms or organizations are not widely known. Public content shared on LinkedIn is broadcast to your network, but also visible to second or third degree connections if your first degree connections likes or comments on your post. This is a great way to increase your visibility and expand your network. "If you maximize your LinkedIn profile, you may not be looking for your next job. It could come find you." Recruiters and hiring managers can’t find or vet you without a complete and fully optimized LinkedIn profile. Jobscan researched recruiter search patterns and search engine optimization techniques that boosts your search impressions by 6x. 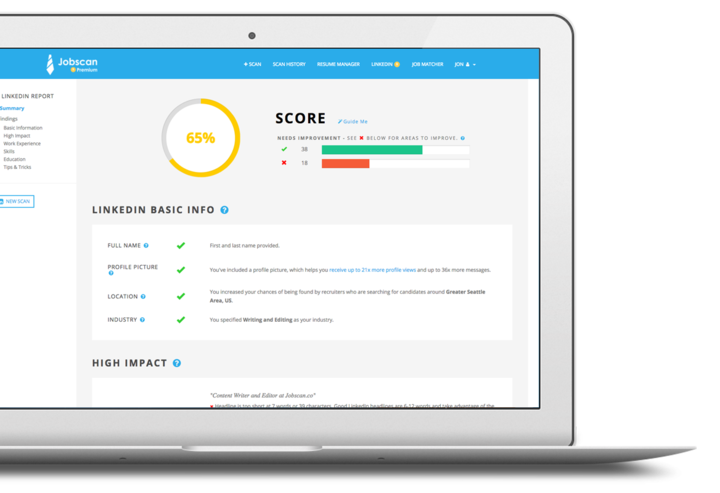 We perform over 40 checks on your LinkedIn profile, including hard skills, measurable results, negative tone and buzz words, vanity URL, tips, and more. We even include sample phrases to help you easily optimize the most high impact sections. Get your scan report within minutes and get noticed on LinkedIn. Power Edit Your Resume New! Jobscan Premium members have access to Power Edit. This tool allows you to upload a docx file, edit your resume based on intelligent keyword and formatting suggestions, see your score increase as you work, then export your final resume. Example of the Power Edit functionality. Premium ATS and Recruiter Findings New! Jobscan Premium members have access to an exclusive suite of resume format findings. 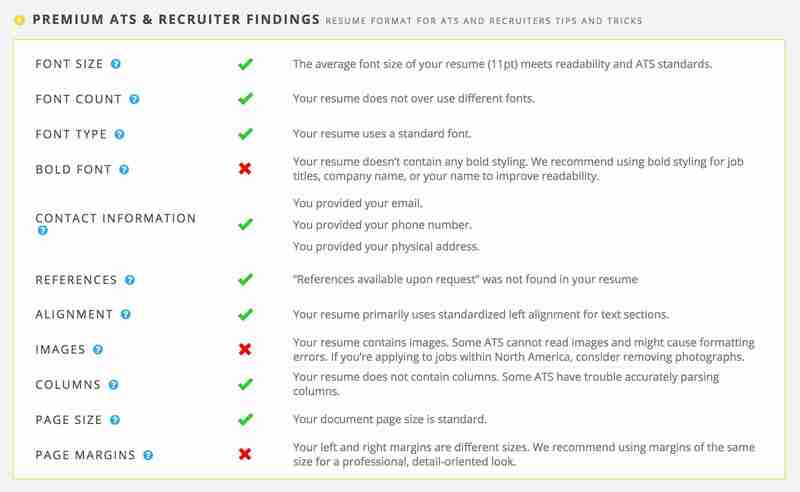 See what our research uncovered regarding dozens of resume format tips and tricks for ATS and recruiters. Screen shot of premium ATS and recruiter findings. Jobscan’s resume manager saves previous resumes and lets you view hard and soft skills matches from previous resumes. Screen shot of the resume manager. Fine tune your resume with technical insights based on the functions and quirks of specific applicant tracking systems. Jobscan Coach members have access to job matches for all of their clients. 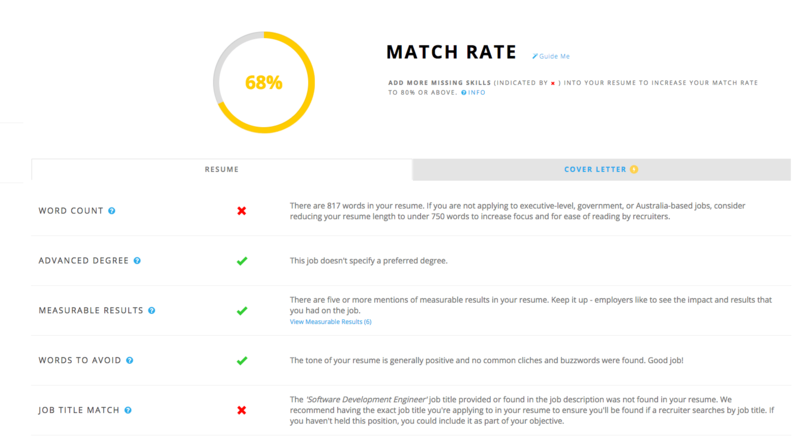 Job Matcher finds available jobs based on skills found in the resume or job description. Example of Job Matcher results. Jobscan Coach members have access to view scan reports for all of their clients. Example of a client's scan reports. 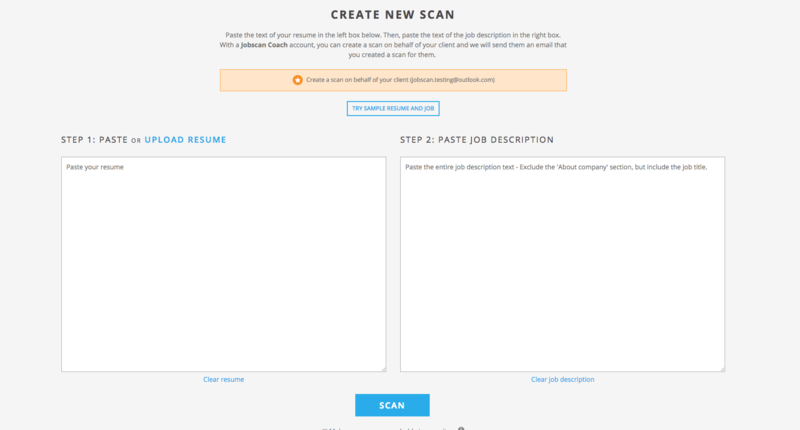 Jobscan Coach members have access to create resume scans for their clients. Example of a resume scan. Jobscan Coach members have access to create LinkedIn scans for their clients. 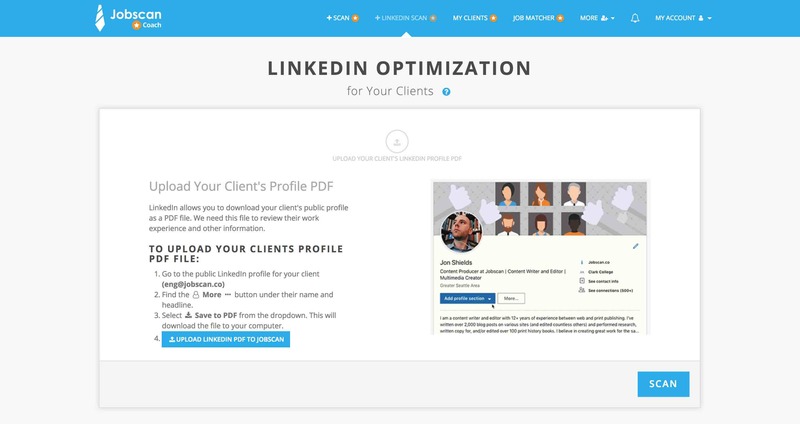 Screenshot of a creating a LinkedIn scan for your client. Jobscan Premium members have complete access to all their previous scans. 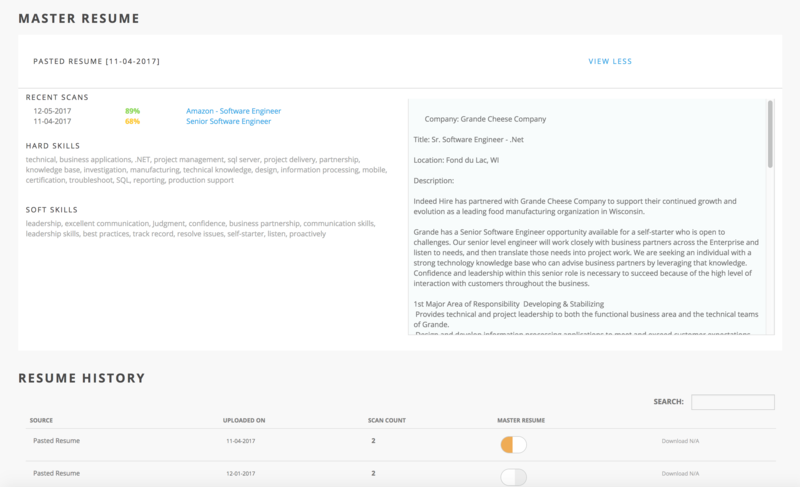 You can star jobs you're most interest in, view previous versions of your resume, and save previous job descriptions. Example of the scan history. Jobscan Premium members have access to unlimited resume and cover letter scans. A scan analyzes your resume and cover letter to provide suggestions that help your resume and cover letter stand out. Example of a resume and cover letter scan report. Jobscan Premium members have access to unlimited LinkedIn profile scans. A scan analyzes your LinkedIn profile to provide suggestions that improve your professionalism and searchability. Example of a LinkedIn scan report. It includes a search to help you find the most relevant resources in our archive of hundreds of articles on resumes, ATS and job searches tactics. Screen shot of Jobscan's Learning Center. Some ATS treat cover letters as searchable text, similar to how it treats your resume. If a cover letter is required, it must be crafted just as carefully to get past software algorithms and impress HR professionals..
We analyzed how popular ATS process cover letters and we hand picked findings to help you boost your match rate. Join job seekers from over 100 countries already using Jobscan. Cancel or renew anytime. Empower client and student job searches with the best resume, cover letter, and LinkedIn tools on the market. Premium ATS & Recruiter Findings New! Can I cancel during my free Premium trial without getting charged? Can I change my premium account at any time? Yes. You can cancel your Jobscan subscription at any time in your account. What types of payment does Jobscan accept? Our online checkout is processed securely by payment provider Stripe, which accepts Visa, MasterCard, American Express and Discover. Is my data safe and secure on Jobscan? We use industry-standard encryption methods for handling your password and we do not store your credit card information. Our server is backed up regularly so your data is safe with us. Why am I not receiving 5 free scans from the free plan? Monthly 5 free scans is capped at 20 scans total. For example, if you have 4 scans on 3/30, then you'll receive 5 scans on 4/1 for a total of 9 scans. However, if you have 18 scans on 3/30, then you'll only receive 2 scans for a maximum of 20 scans. However, you'll continue to receive scans beyond 20 from friend referrals or participating in our marketing campaigns. Why is my card being charged $0.99? Jobscan will make a temporary $0.99 authorization on your card to verify it. This is an authorization only and will be refunded to you. Your bank may inform you of the authorization. See the full Jobscan Terms of Service Agreement or Email us at [email protected].